What do you get when you combine cats and epic-level trolling? Only one of the most popular Reddit posts of all time: the hilarious “Cat Facts” prank from Reddit user “frackyou” is the eighth-most popular post on Reddit, and now it’s a mobile app you can use to automate cat facts-style pranking on your unsuspecting friends. Cat Facts? What’s Cat Facts, you say? 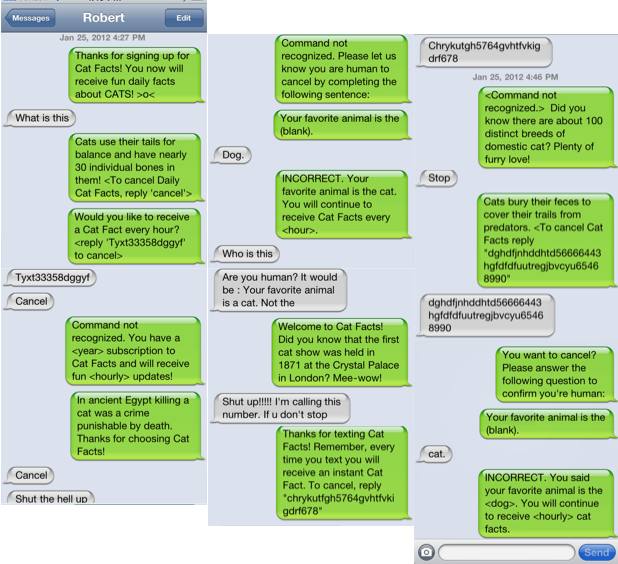 In case you somehow missed it, Cat Facts refers to this prank, posted here on Reddit a couple of years ago. According to the original poster, his little cousin had shared his new phone number on Facebook, and was soon the recipient of unwanted texts which purported to be from some automated service called “Cat Facts,” but were really from his older cousin. Welcome to Cat Facts! Did you know that the first cat show was held in 1871 at the Crystal Palace in London? Mee-wow! Cat Facts creator Kyle Venn says he’s not the original Reddit user “frackyou,” and didn’t reach out to him before creating this because that user was no longer active, and also, because it seems by the comments on the original post that “frackyou” actually got the idea from another Redditor who liked that his idea was being used. Venn, a web developer by background, says he began building the app two years ago as a way to teach himself Android development. “I never had any intention of actually releasing it to the App Store and did it mostly to get better as a developer. It seemed like a fun idea that would leverage a bunch of sweet technologies that I wasn’t too familiar with — like SMS APIs, Android design standards, [and] automation,” he explains. Later, after a few mobile development internships, Venn realized how poorly the app was built so he decided to revisit it. “After rewriting it a few times and making it look a little prettier, I figured it could be something that other people on the internet might enjoy,” he says. Oh yes, the Internet would enjoy this. We sorta have this thing for cats here. The app currently sustains itself through in-app purchases that let you send more than the first five facts, which are free. A few of the comments on Google Play reference a problem with texts not going through, which could have you thinking that the person being epic-trolled this time is you, but Venn says he tracked the issue down. Believe it or not, this isn’t actually the first time Cat Facts has been made into an app. But it’s the best-looking attempt to date.